Though I have been hard-core enthusiast and sometime black belt of GTD since around the age of 20 (i.e., nearly a decade), I’ll admit to having had a certain initial reluctance and skepticism about OmniFocus. Perhaps this was due to the seeming eternity the notional app spent as vaporware, but I think it was mainly my bafflement at first opening the program shortly after its beta release. In its tiny default font and weird spacing, it presented the user with an empty list and almost no guidance on what the program does or how to use its amazingly complicated array of options for every conceivable combination and permutation of projects, lists, children, parents, siblings, start dates, dependencies, etc. I futzed with for a few minutes, realized I didn’t have a full week to spend learning a piece of software that seemed to make a simple task more complex and didn’t allow me to sync my data across computers, and I gave up. As syncing and other improvements like increased clarity of features and flexibility of configuration options and the ability to customize the appearance of lists came along, OmniFocus was already dead to me. It wasn’t until much later when a chance frustration with the weight and drudgery of my own makeshift pen-and-paper GTD implementation drove me to give it another try that I learned precisely how amazing an implementation of David Allen’s system the folks at OmniGroup had ultimately come up with. It renders elegant and easy elements of the GTD workflow that were previously either cumbersome or completely impossible to do properly with a paper-based system (or, worse, a system based on a hack of an existing piece of software built for another purpose). I will add, however, that it wasn’t until spending a few hours slogging through the manual that I finally “got” this about OmniFocus, and frankly I can’t imagine anyone else just downloading the software, playing around with it, and making it their primary productivity tool spontaneously. The learning curve for OmniFocus is honestly far steeper than with any other piece of desktop software I have ever used. What I have since learned, however, is that the payoff is very much worth the effort. A lot of attention is paid around the web to GTD as a “list keeping” system—as something that has primarily to do with keeping track of lots of little mundane life details. But as is to be expected with the Internet and human culture in general, the popular conception has missed the point entirely—or, rather, gotten it almost entirely backwards. The great achievement of David Allen’s framework has more to do with relieving stress about work than organizing your lists, a fact that is seemingly lost on most of the GTD-professing masses who spend all day twittering about lifehacks and Moleskine list-management. 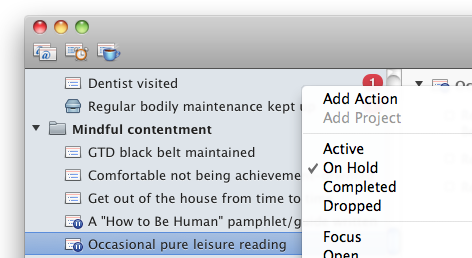 GTD is about psychology, not “productivity” per se. Moreover, the system pays most of its psychological benefits when it’s implemented fully, and I mean really nitty-gritty, every-little-thing-in-your-head fully. The difference between 99% and 100% implementation is truly vast, as anyone who has made it to 100% readily attests (David himself included). If you’ll permit a TNG anology: the difference between Warp 1 and 2 is of an altogether different magnitude than between 9 and 10. If you’re just borrowing ideas from GTD here and there, like the idea of grouping your to-do lists by context, you’re missing almost everything GTD has to offer, which is a terrible shame. 1) Giving you the confidence that you have everything “captured” in a system that you trust to keep track of it all so you don’t have constantly to feel like you have to keep everything in your head. This is fruitful because it means you’re freed for mindful focus on the work at hand, which is increasingly important in our world of “knowledge-workers” and environmentally-induced ADD. 2) Providing you with a list of only those things you can and should be doing right now, so you don’t feel the burden of your whole universe of projects and tasks weighing upon you as you choose what to do and then set about doing it. You should be able to survey the landscape of all that you have to do and quickly choose the appropriate thing to be doing and then abandon yourself to that task, trusting that everything else will get taken care of (because you know it’s well tracked) and done efficiently (because you’ll be reminded of it when and only when you’re in the right context). The mechanics of a great “system” thus exist to serve this ultimate goal. OmniFocus, with its easy-access (keyboard shortcut) and omnipresent rapid entry window, is great at #1 above, but that’s not so special. 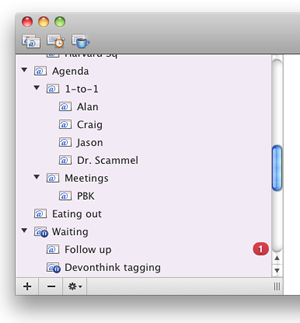 So is a paper in-tray, or the whole array of other GTD-themed apps out there. What sets OmniFocus apart, however, from cutesy wanna-be playthings like Things.app, is its amazingly serious-minded approach to #2. OmniFocus is positively brilliant at hiding things from you when you don’t want or need to be looking at them, which is the single most important way to avoid being overwhelmed and paralyzed by the sheer size of most project/action lists that inevitably—and quite rightly—result from a thoroughgoing adherence to GTD methodology. The main point of OmniFocus is to hide things from you that you can’t possibly be doing right now while still letting you track them. This way you don’t have to freak out when you’re looking for a menu of things to do when you roll out of bed in the morning and a million stimuli are bombarding you all screaming for immediate attention. If you don’t use OmniFocus with this end always in mind, you’re missing most of what’s useful about it. 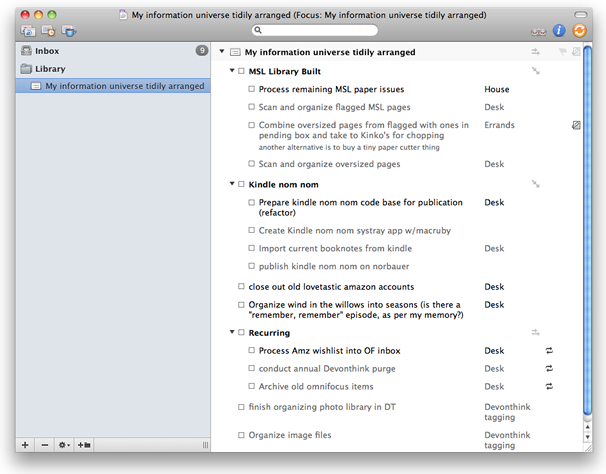 Otherwise, OmniFocus is just a weird-looking and pointlessly complicated list-maker. It wasn’t until I fully wrapped my head around the distinction between these two fundamentally different views and their respective places in the GTD workflow that I was finally able to start understanding how to use OmniFocus properly, and its true power. Project mode lets you plan out in detail everything that you have some sense of commitment to do something about in your world at some point in the future. Context mode lets you pick what next physical actions to take on those larger commitments, among only those that make sense to even be considering at the present moment. Those little arrows next to project groupings in planning mode indicate whether tasks in that grouping must be completed in sequence to be available ( ) or if they can be all available at once ( ), which is called a “parallel” project/grouping. Notice that blocked items in sequential groupings are grayed out. This means that OmniFocus considers them not to be “available” and they thus won’t show up in your working view, assuming you have your default view filter set in the working view (as I do, and as you should) to hide non-available actions. 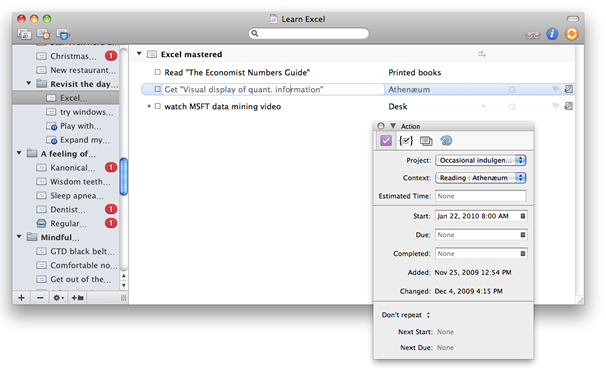 When one sequential task is completed, others below it will become automatically available. This highly filtered context view of available actions is what you should be using when you’re actually trying to decide what to do today. There are other ways of hiding actions from your active working view that you can’t/shouldn’t be working on right now. You can set tasks not to start until the future, as I’m doing below for a book that I’m waiting for from the library and is due to be returned on 22 January. This task (automatically grayed out for the time being) won’t show up in my menu of tasks for the day until 22 January, when I can actually do something about it. You can also assign tasks to a context that you have set to a status of “paused,” as I have done below for those tasks that I can’t do until DevonThink releases its forthcoming tagging feature. When DevonThink releases this feature, I can just set the context status to “active” and all of its tasks will suddenly show up in my context view. You can also simply decide on a whim that a planned project isn’t a priority for the moment when you’re feeling overwhelmed and put it and its tasks on hold temporarily. All of these tools (and there are others I haven’t mentioned—RTFM, for reals; you won’t regret it!) allow you to feel free and creative in your planning, while still knowing that you’re not cluttering up your workaday lists with stuff you can’t do right now. With a paper-based system, this kind of planning—and the sense of relief that comes with it—would be impossible, because you’d have to sift through lists of hundreds upon hundreds of possible actions in order to choose what to do at any given moment, which is a system that rapidly collapses under its own weight. David Allen’s latest book, which is much more digitally savvy and less buzzwordy (i.e., more approachable) than his last two books.